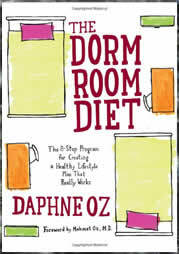 The Dorm Room Diet is a guide to help college students avoid the dreaded ‘Freshmen 15‘ by learning healthy eating habits and avoiding the common pitfalls and challenges associated with college life – such as late night studying and parties. It was written by Daphne Oz, who is the daughter of Lisa and Dr. Mehmet Oz, co-authors of the bestselling books, You: The Owner’s Manual, You: The Smart Patient, and You: On a Diet. Daphne gained weight during her teenage years and lost 30 pounds after she started college and has written about her experiences and success in changing her lifestyle. The Dorm Room Diet is not a specific diet plan but more of a healthy diet and lifestyle guide that is targeted at young women who are starting college. It advocates sensible principles of eating, exercise and the use of nutritional supplements. Drink half your body weight in ounces of water daily, including one glass before every meal. Eat something every three hours (three meals and two snacks of fruit or veggies). Don’t eat anything at least two hours before bed. Be prepared for study sessions with healthy snacks. The book includes many practical tips and food suggestions with an emphasis on eating for health. General recommendations include avoiding sugary cereals and fried food, creamy sauces, full fat dairy products and sodas. Her approach is not overly restrictive and allows treats in moderation. Daphne suggests keeping a supply of fruit and vegetables on hand for snacks and preparing for late night study sessions with healthy fuel sources like apples, pears, rice cakes and soy crisps. She also recommends eating a handful of semisweet chocolate chips to cope with fatigue during long study sessions, which is about 100 calories and contains less sugar than milk chocolate. If craving something sweet at night Daphne advises to have sparkling water with fruit juice before eating anything because, as she says, the bubbles fill you up without making you feel bloated and this can avoid intake of excess calories before bed. She also suggests eating grapefruit because it is a natural appetite suppressant. Find some quick and easy healthy recipes here. Daphne advises college students to utilize the college gym at least 3 days a week with a combination of cardio and resistance exercises and also offers advice for exercising in a small space such as a dorm room. She has also combined with Celebrity trainer Joel Harper to create a 20 minute workout DVD that is sold separately to the book. These exercises can also be used with the Dorm Room Diet. Especially suitable for young female college students as deals with the issues surrounding this group that may impact on the ability to make healthy food choices. Helps to increase awareness about emotional triggers of overeating and the reasons for being motivated to undertake a healthier lifestyle. Practical advice that is easy to follow with a good variety of food recommendations. May not be as beneficial for those that don’t fit into the target audience. May be difficult for those on a collage budget to stick with the food and supplement recommendations. Daphne writes in an easy to read style and many readers will relate to her personal experience and success with losing weight. The book’s strongest point is the emphasis placed on adjusting to the specific challenges of collage life. It is a balanced approach that helps college students to become more aware of their relationship to food and gives practical and easy to follow advice on how to stay healthy and avoid gaining weight during this transition. Oz, D. (2006). Dorm Room Diet. Newmarket Press. it has worked for me so far! !